How do you measure if your content marketing strategy is successful or not? For most marketers, the answer is: traffic, leads, revenue. We all know now that creating great content on a regular basis is not enough to succeed. If you want your content to be read – and appreciated – by your audience, you need an impeccable distribution system. And there are two main channels to distribute your content: social media and email. Email marketing is the #1 digital channel for user engagement because it improves your results, and it is the breeding ground of highly-valuable data. According to a study from Email Monday, “74% sees email marketing still being one of the channels with the highest return on investment.” In fact, in 2016, people receive an average of 90 emails per day – this number has been growing every year and will continue to grow. But what kind of results can you expect from good email distribution? If you include three blog posts per newsletter and have an impressive 15% overall click-through rate, it means one of your blog posts is probably seen by about 5% of your subscribers. Meaning that 95% didn’t see it. That’s a lot of people who missed seeing your content. That’s why you need to send your newsletter more often. As soon as you start sending emails more frequently, you’ll generated better results. Here’s what will happen if you send content newsletters on a weekly basis without degrading the quality: your open rate will go up a bit but much more importantly, your increased frequency will drive the number of recipients you usually reach through the roof by a factor of 2.5x. The data has spoken: sending out weekly newsletters helps you reach more recipients. Even though it is proven that sending newsletters more often generates better results, only 29% of marketers manage to send email newsletters on a weekly basis or more (just 8% being email rockstars with daily newsletters). Spam concerns: Many companies believe that sending emails too frequently is spam. Spam is about sending unwanted emails such as promotional content or irrelevant stuff like company news or company-centric content. But content marketing’s goal is to send customer-centric content that educates, informs, entertains and add value to recipients. Not enough good content: I would challenge the idea that it’s ok to publish bad content on a blog but the point is marketers often don’t have enough good content to send more emails. If this is your case, supplementing your own content with curated content is the most effective way to overcome that problem: we’ve shared how to do it and what results to expect here. Time consumed / complexity: last but most importantly, some marketers know they have to distribute their content by email but are finding the problem too complex and time consuming. Sending an email is easy, but the content newsletter process is complex: ideally, you would want to analyze data to select what content to include, create a summary for each post, copy/paste links , format the resulting email HTML etc… and schedule your email blast. To help you solve the ” not enough good content” challenge, our product helps you supplement part of your content production with content curation. This technique has numerous benefits, especially if you’re looking to save time and money while producing content more frequently. As for the time-consuming and complexity to create newsletters, we have just the perfect solution and you’re going to love it! 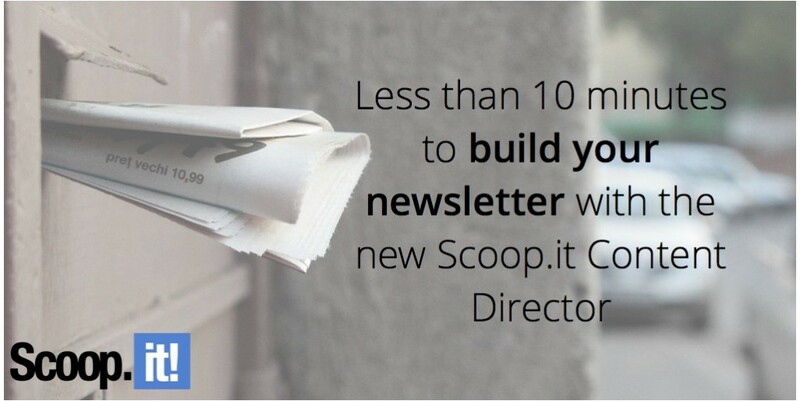 Scoop.it Content Director’s newsletter editor makes it super easy for you to create your newsletters through simple drag-and-drops of your curated and original content. Ready to save time on your next email campaign? Watch the video below! Search in different topics and filter by keyword (useful to retrieve older content). Remember that only 5% of your audience have seen any given content you’ve shared in a previous newsletter, and since the last promotion of your piece, there is a completely new audience who has never seen your content before. You can either choose one of our basic templates, or simply create one of your own! Then you can edit your newsletter the way you want, with relevant images and links. Customize it until you think it looks good enough! Once you are completely happy with the content and you have it ready to be sent, you can integrate your newsletter directly with Mailchimp, or export the HTML code to use it with the email provider of your choice. So here it is! We would love to hear your feedback on this updated feature, so feel free to reach out in the comments section down below.